Climate change will force hundreds of ocean fish and invertebrate species, including some of the most economically important to the United States, to move northward, disrupting fisheries in the United States and Canada, a Rutgers University-led study reports. The study, published today in the journal PLOS ONE, covers the North American continental shelfs on the Pacific and Atlantic coasts. Previous studies have been global or regional, thus being too large or too small to get a clear picture of the future for North America's fisheries. The species surveyed include finfish, sharks and rays, crustaceans, and squid. Among those most affected are Pacific rockfishes, Atlantic cod and black sea bass. Fish are sensitive to the temperatures of the water where they live, and as it becomes too warm, populations often shift to where the water temperature is right for them. This process has already begun, though at different rates in different places. As climate change continues and the oceans warm up, the study shows, more species of fish will move north to where the temperature range is habitable for them. 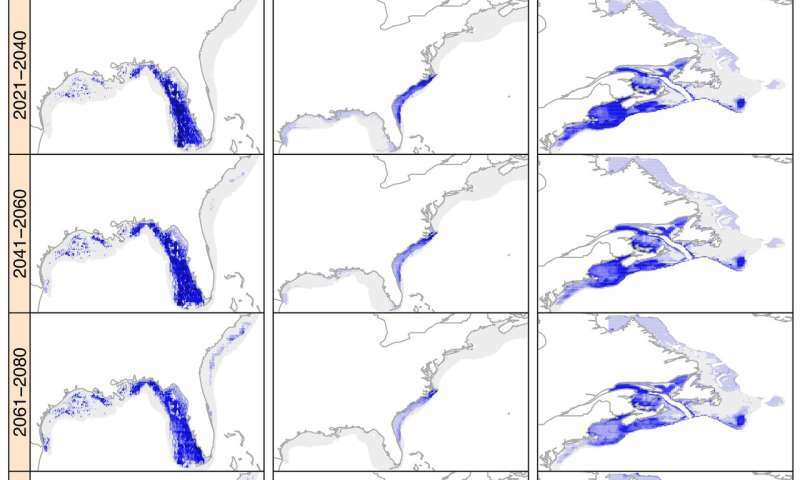 "We've already seen that shifts of a couple of hundred miles in a species' range can disrupt fisheries," said lead author James Morley, a former postdoctoral researcher at Rutgers-New Brunswick. "This study shows that such dislocations will happen all over the continent and on both coasts throughout the 21st century." "For commercial fishers, this often means longer trips and higher fuel costs," said co-author Malin Pinsky, a professor of ecology, evolution and natural resources at the School of Environmental and Biological Sciences at Rutgers University-New Brunswick. "Some species along the U.S. and Canadian Pacific coasts will move as much as 900 miles north from their current habitats." The researchers used 16 different climate models, each with both a low level of greenhouse gas emissions and a high level, to develop projections for future ocean temperatures around North America. The lower-level emissions scenario is in line with goals set by the Paris Accords, from which President Trump withdrew the United States earlier this year. These climate projections were combined with statistical models of species temperature preference, which were based on bottom-trawl survey data from around the continent. While both high and low emission scenarios project some northward shift, the shifts in species habitat will be two to three times greater under a high emissions future. Among the northward moving species is the Alaskan king crab. "People in that fishery already travel a long way to catch crabs—many from as far away as Seattle—so this may not make a big difference to them in the short term," Pinsky said. "But if you're based in North Carolina, fishing for black sea bass, and you have to travel 300 or 400 extra miles to do it, that's a real problem."